CRIME, GUNS, AND VIDEOTAPE: Edward Snowden Hero or Traitor? It’s Up to You to Decide! 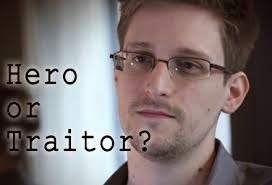 Edward Snowden Hero or Traitor? It’s Up to You to Decide! Somewhere in Russia---German Public Television network ADR caught up with Edward Snowden for an exclusive interview. This interview has been removed form YouTube and numerous other video sharing sites because it is against interest of our rogue government. Snowden risked his $250,000.00 per year job, his liberty and very life to expose the most unlawful, vast and Machiavellian government surveillance program in the history of the entire world. Snowden has proven that while we slept criminals have obtained total control of our government in a secret and bloodless Coup d'état. The unlawful NSA spying was not something that any elected politicians ever offered in their campaign speeches. Had they done so, they would have never gotten elected. Barack Obama cannot claim ignorance or dare deny responsibility for this multi-billion dollar tax funded criminal government enterprise. Agents learning embarrassing personal secrets to blackmail members of Congress, judges, prosecutors, or political candidates forcing them to vote or make rulings in ways inconsistent with the law or public good. Agents that steal trade secrets from inventors and businesses could enrich themselves selling them to competing businesses all over the world. Agents would be able to learn inside financial information on any and all publically traded companies and obtain untold wealth through insider trading. Can we now be sure for example that Conservative U.S. Supreme Court Chief Justice John Roberts was not blackmailed into uncharacteristically voting to uphold the Obamacare massive train wreck? No American is safe from the worst kind of abuse or monstrous crime carried out by a government that refuses to act within our established laws and Constitution. We cannot allow our politicians to create and maintain massive programs that violate every American principal or freedom that we ever fought to maintain. The creation of the Snowden exposed NSA domestic spying program is nothing less than Treason and those responsible for it should be arrested and put on trial. Edward Snowden is a hero in every respect. He risked all to expose this and we have a duty to stop this cancer on our government. Watch this video interview while you still can! Definate Hero, despite what the New World Order-controlled U.S. Media says. Now we need many other brave others to step up to the plate to confront & stop the surveillance societies.